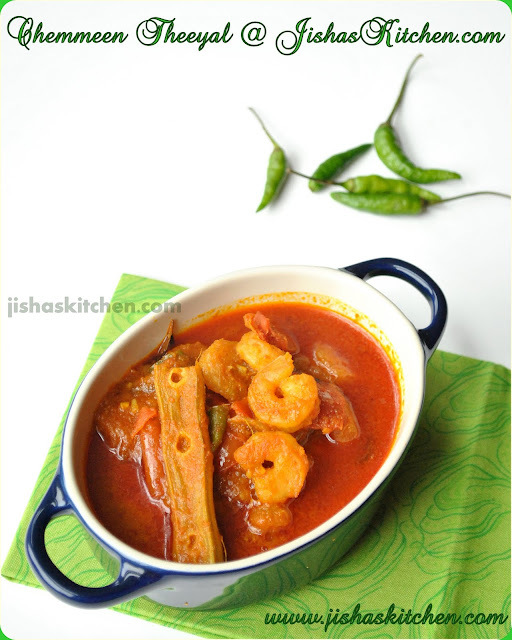 Today I am sharing the recipe of Cheemeen theeyal / Konju Theeyal / Prawn in fried coconut gravy. First heat 1 tbsp of oil in a pan and add grated coconut and in a low flame keep on roasting it till they become dark brown in color. This might take about 15-20 minutes but do make sure to stir continuously otherwise it may be get burnt. 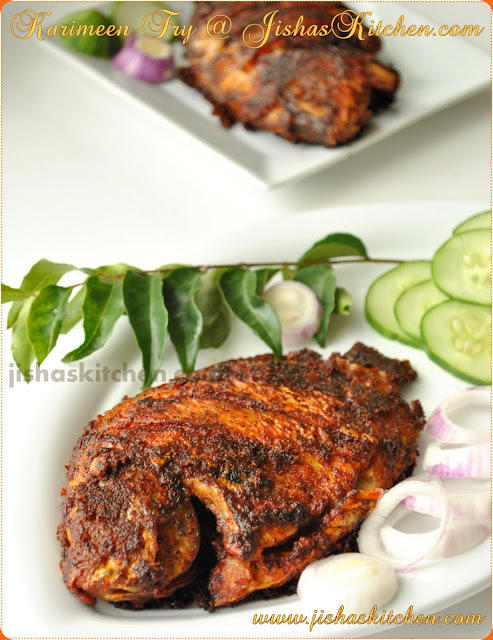 When the grated coconut becomes dark brown in color, add red chilly powder, coriander powder and fennel seeds and fry for about 1 minute or till the raw smell of the powders go. Then remove it from the flame and allow it to cool and then grind it to a fine paste by adding 1/4 cup of water. Meanwhile heat 2 tbsp oil in an another pan and add curry leaves, sliced shallots, chopped green chillies and chopped ginger and garlic and saute till onions become translucent. Then add drumsticks, prawns, turmeric powder, chopped tomato, salt and 1/2 cup water and cook covered for about 10-15 minutes. Then add ground coconut paste along with tamarind paste and mix it nicely. Cook uncovered in a medium-low flame for another 10 minutes and then remove from the flame. 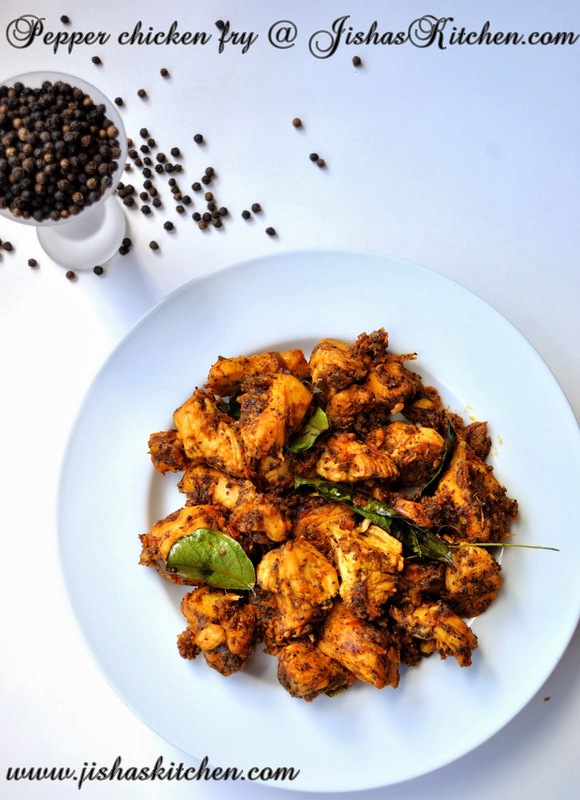 Slurp,fingerlicking chemeen theeyal, simply irresistible..
Yummy chemmeen theeyal! !well prepared as well..I had thoughts to post this,good one! Adipoli theeyal konjum, muringakayum entha combo. looks exactly like how mom used to make..
nice tempting shrimp dish!...yummy with rice! so colorful and very tempting curry !! Wonderful looking shrimp preparation dear. Great recipe. That sounds and looks superb dear ~ very nice pics! theeyal is really tempting and delicious.. I can smell the drumstick & prawn flavour here ! I think we all have lots of interest in Prawns in any form..Lovely ! 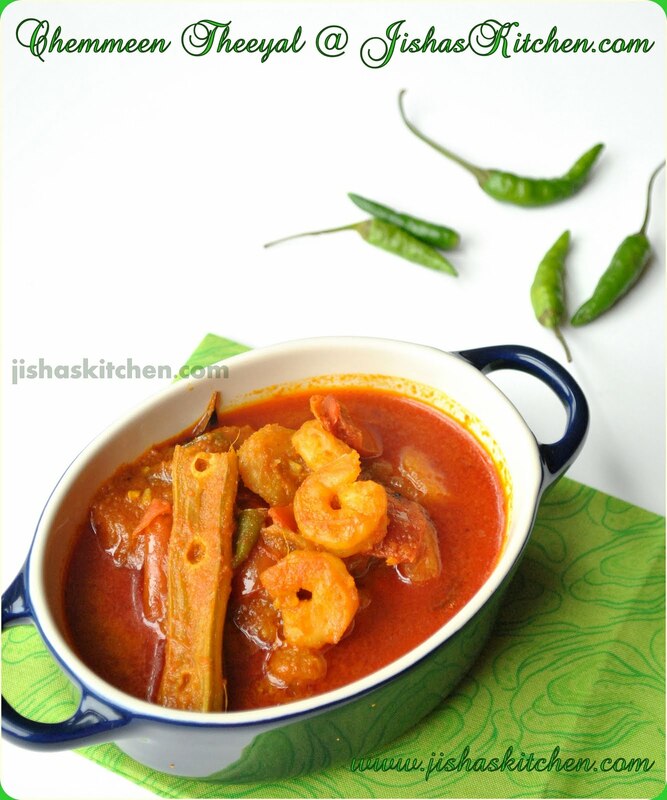 Prawn curry looks very tempting..recipe seems so simple and neat.. This is very suitable and tasty with rice! Slurp! this is awesome buddy..you ve managed to cook a successful classic .. Delicious and yummy curry..drooling over here..wish I can take that bowl from the screen..YUM! Mouth watering curry. I loved it. And thank u for u r appreciation dear. Felt happy by seeing u r comment. The chemmeen theeyal inviting me....want to try this soon..
chemmen and muringa..awesome combination..curry looks terrific! !